During the past few days we have acquired two sets of autograph letters by John Honey. One set, as the image below illustrates, contains a large number of letters connected with the reception of his controversial pamphlet The Language Trap (1983). Wilkinson, Michael: Personal Papers and letters relating to Michael Wilkinson, approx * 1940, formerly of Willet Close, Petts Wood, Orpington, Kent. not published 1980. 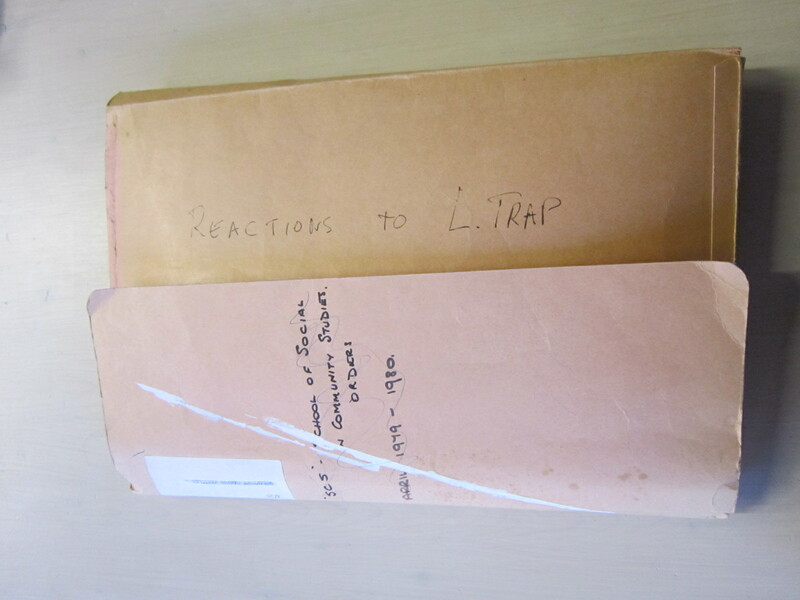 This is a folder with letters exchanged between pupils at City of London School and later Pembroke College Cambridge in the 1950ies, documents of a deep and possibly romantic relationship between Michael and John, including a testament dated 1955, entitled in a somewhat learned manner “Wilkinsoniana” on folder kept by John (last name withheld). We should like to get hold of more letters by John Honey. One colleague has already kindly sent us several letters she received from him during the mid 1990s. I myself once received a letter from him, too, but unfortunately no longer have it. The letters I have seen so far are of interest not only because they throw light on the controversy surrounding the publication of The Language Trap, but also because they discuss usage features that were of current interest at the time, such as confusion between lie and lay and usage of may have for might have. It goes without saying that we will treat the documents people might want to send to us – or share with us in the form of xerox copies – with the utmost care and discretion. One reader of this blog informed us that The Language Trap, for those interested in acquiring a copy, is available from Amazon.com. At the moment of writing this, there are six copies for sale. Gallery | This entry was posted in usage features and tagged John Honey, letters, The Language Trap. Bookmark the permalink.